Here’s some text from a PBS interview with Michael Pollan, entitled “Modern Meat”. This covers the need for the holes (“Rumen Fistula”) and more. Read the whole thing via the link, this snippet is just the beginning. The problem with this system, or one of the problems with this system, is that cows are not evolved to digest corn. It creates all sorts of problems for them. The rumen is designed for grass. And corn is just too rich, too starchy. So as soon as you introduce corn, the animal is liable to get sick. It creates a whole [host] of changes to the animal. So you have to essentially teach them how to eat corn. You teach their bodies to adjust. And this is done in something called the backgrounding pen at the ranch, which is kind of the prep school for the feedlot. Here’s where you teach them how to eat corn. You start giving them antibiotics, because as soon as you give them corn, you’ve disturbed their digestion, and they’re apt to get sick, so you then have to give them drugs. That’s how you get in this whole cycle of drugs and meat. By feeding them what they’re not equipped to eat well, we then go down this path of technological fixes, and the first is the antibiotics. Once they start eating the [corn], they’re more vulnerable. They’re stressed, so they’re more vulnerable to all the different diseases cows get. But specifically they get bloat, which is just a horrible thing to happen. They stop ruminating. You have the image of a cow on grass of the cow ruminating, which is chewing its cud and burping a lot. In fact, a lot of greenhouse gases come out of the stock as methane emerges from their mouth as they eructate — it’s a technical term. And they bring down saliva in this process, and it keeps their stomach very base rather than acid. So you put in the corn, and this layer of slime forms over the rumen. You’ve got to picture the rumen. It’s a 45-gallon fermentation tank. It’s essentially fermenting the grass. Suddenly your slime forms and the gas can’t escape, and the rumen just expands like a balloon. It’s pressing against the lungs and the heart, and if nothing is done, the animal suffocates. 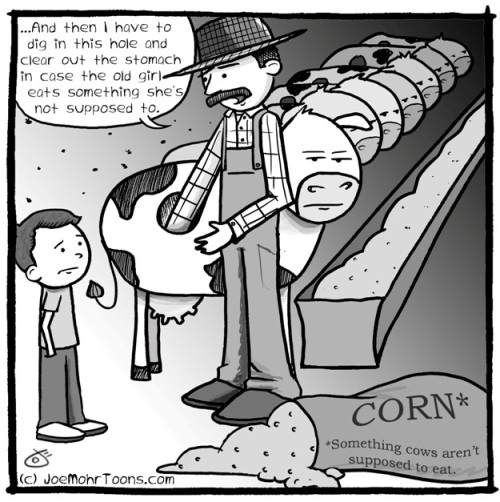 …Of course, something is done so the animals do not suffocate–holes, or rumen fistulas, are cut in the side of the cow to allow the gas to escape and the undigested corn to be scooped out. Some farmers will claim fistulas are good for their cows because it extends their lives. This is a dangerous half-truth. Their life is made shorter due to common factory farming practices (confined quarters, inproper diet, etc. ), and the fistula prolongs their factory-farm shortened life. Fistulas don’t address the problem of eating corn, it reacts to the problem of eating corn. Neither the cow, nor the consumer benefit from corn feed. …we give (cattle) antibiotics to keep them from getting sick from other things we’re doing to them. … So a lot of it is prophylactic, is being used to prevent them from getting sick. Then you also have the antibiotics used to keep them from having liver disease because they can’t digest the corn. And so there were many, many reasons that we were using them. Very few of them have to do with treating sick animals, although the beef case kind of confounds the usual argument. If you talk to public health advocates, they say, “It’s fine to use antibiotics on sick animals; we just don’t want them used for growth promotion.” But exactly how do you categorize an antibiotic you’ve giving an animal because you’ve made it sick? And that’s what we’re doing. So that kind of falls in the middle. Why is this a problem? We exist in the same microbial environment as these animals. So whatever you do to that ecosystem of germs, to them, is going to redound to us. … Evolution is going on, and microbes are evolving to withstand those antibiotics. This is how evolution works. When there is a threat to the survival of any population, whatever members of that population … are not susceptible, they then grow. Their population explodes. You select for resistance. And that’s what’s happening. We’re selecting for resistance in the guts of these animals, in the manure on the ground, in the water downstream of these places. And microbes are evolving that can withstand Cipro, that can withstand Tetracycline, that can withstand [other antibiotics]. This is helping in hospitals, too. I mean, this is not the only cause of antibiotic resistance. But given that most of the antibiotics are used in agriculture, the belief is that a lot of these superbugs that are showing up in hospitals that are not susceptible to any antibiotics are being created by their process. … And so you have this phenomenon [that] we simply can’t treat. We’re getting antibiotic-resistant gonorrhea. We’re getting antibiotic-resistant tuberculosis. Public health advocates think perhaps this is the most serious threat to our public health over the next several years, because new antibiotics are not coming along as fast as we thought they would. So many inaccuracies in both the picture and the excerpt accompanying it. To begin, the picture shows the farmer accessing the rumen on the right side of the animal. The rumen is always located on the left side with no exceptions. Secondly, the article talks about rumen fistulas like they are a common thing. They are actually very uncommon and only used for research purposes. They are never used for treatment. Lastly, cattle are not automatically given antibiotics to treat acidosis (over consumption of grain). Treatments mostly consist of probiotics as the issue at hand is imbalance of rumen microbes. Acidosis is prevented by slowly introducing grain to the animals diet so that the microbes have time to adjust. That’s it. No antibiotics. This kind of rumen inbalance can be caused by an overconsumption of many different feeds. Many of which can be found in pastures as well such as clovers and alfalfa. It’s not a matter of animals being fed something that is “bad for them”. It’s all about proper management. I would encourage you to visit an actual farm to gain knowledge on the subject instead of relying on information from someone who doesn’t know how it works. Sincerely, a veterinarian.